Halloween chills, winter holiday magic and encounters with Marvel Super Heroes or characters from across the Star Wars galaxy…all on your Disney cruise! Did you know that Disney Cruise Line offers special days at sea and holiday cruises throughout the year? From ghoulish delights to galactic nights, there are so many ways for your family to make memories during these one-of-a-kind celebrations! Which themed Disney cruise sounds right for you? 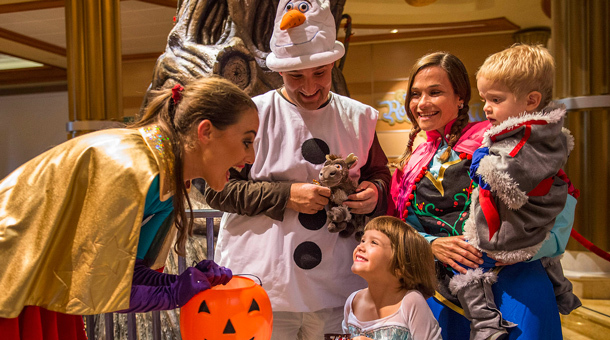 Halloween is in full swing on Disney’s Halloween on the High Seas cruises! 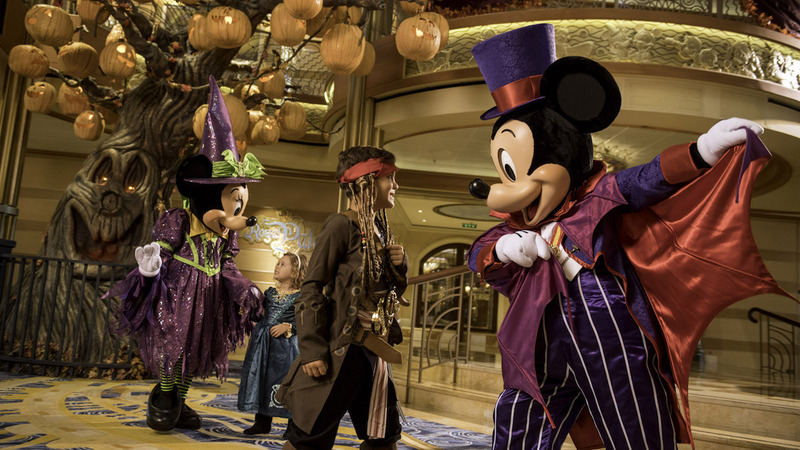 Set sail for spook-tacular Disney fun including a family costume party, an adult-only costume contest, a “sing and scream” movie experience and haunted stories of the sea beneath the night sky. So If you love creative costumes, special Halloween treats and frightfully fun décor, then you won’t want to miss this wicked celebration! The fun continues in fall 2019 aboard all four ships, with 4- to 7-night cruises departing from New York City, San Diego and Port Canaveral, Florida. Unwrap some holiday magic with Disney Cruise Line! In November and December, our ships will transform into winter wonderlands for our Very Merrytime Cruises. 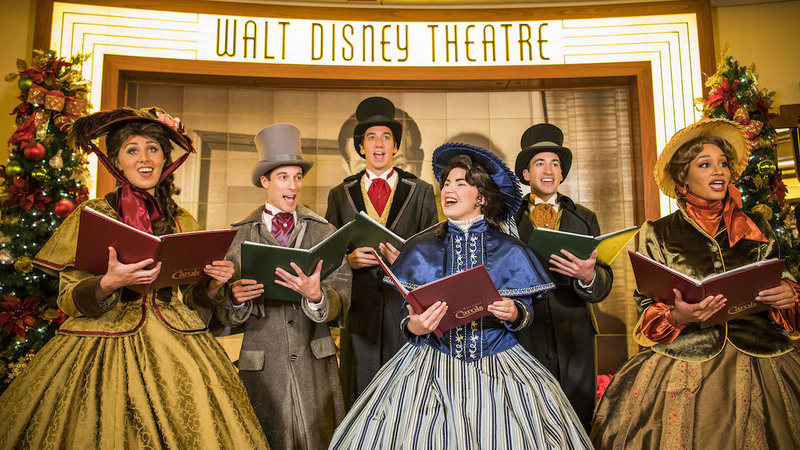 If you want to sail away from the winter weather this season, what better way to celebrate the holidays than with festive tropical deck parties, carolers throughout the ship and Disney friends dressed in their holiday best? These 3- to 7-night sailings depart from New York City, Galveston, Texas and Port Canaveral, Florida. Want to unleash your inner Super Hero? Join forces with some of Marvel’s mightiest heroes during Marvel Day at Sea. 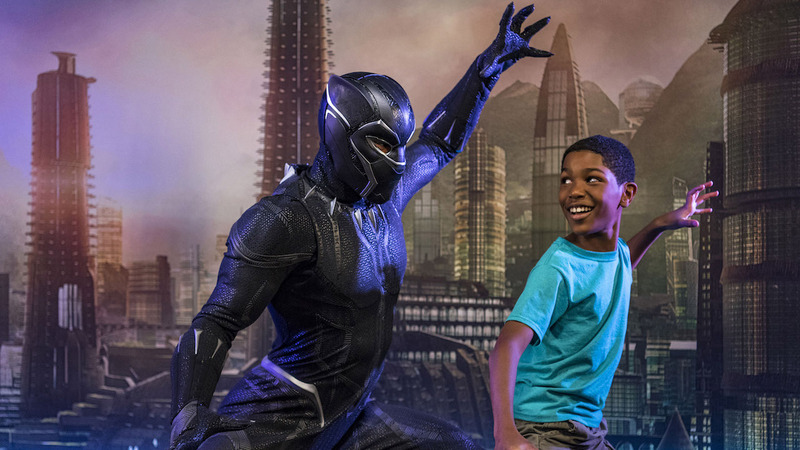 Returning in 2019, these popular cruises let you step right into the epic adventures of your favorite Marvel Super Heroes and Villains — from heroic character encounters to secret agent training sessions to an epic stunt show at sea! Marvel Day at Sea returns in January on select 5-night cruises from Miami to the Bahamas and the Western Caribbean. For all you Star Wars fans, be transported to a galaxy far, far away…on the high seas. 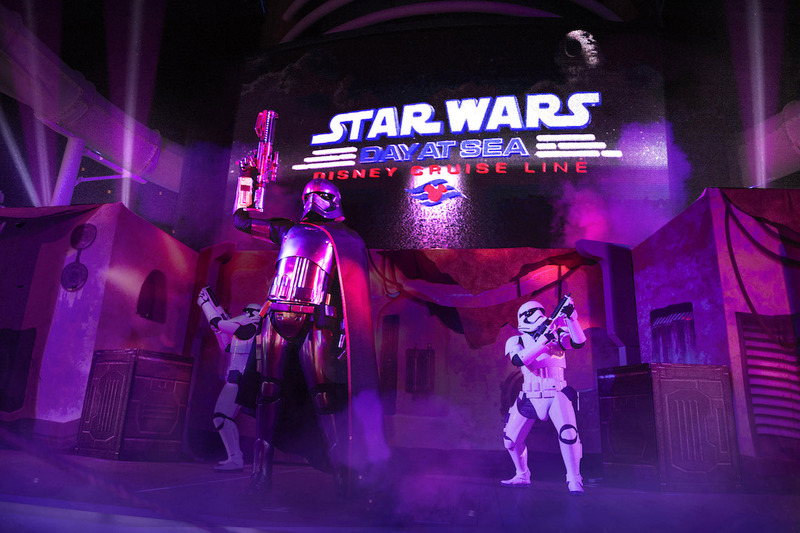 Blast off on Star Wars Day at Sea cruises in early 2019! Experience the legendary adventures of the saga up close through epic character encounters, Jedi training, a deck party spectacular and more on a day-long adventure. This Force-filled day at sea takes place on select 7-night Eastern and Western Caribbean cruises from Port Canaveral starting in January. Are these cruises calling your name? Join us for any one of our adventures on the open water — you won’t want to miss out on any of the excitement Disney Cruise Line has in store! This entry was posted in Cruises, Disney, Disney Cruise Line, Disney Cruise Line and tagged Halloween on the High Seas, Marvel Day at Sea, Star Wars Day at Sea, Very Merrytime cruises on October 26, 2018 by siera. Disney Cruise Line will treat guests sailing this fall to a wickedly good time as the ships transform into a ghoulish wonderland filled with frightfully fun events and activities, special decorations, unique menu items in the restaurants and themed parties, starting in September through the end of October. Mickey’s Mouse-querade Party, a celebration with games, dancing and lots of candy! Beloved Disney characters, wearing special Halloween costumes just for the occasion, will join guests for this fun-filled costume party. 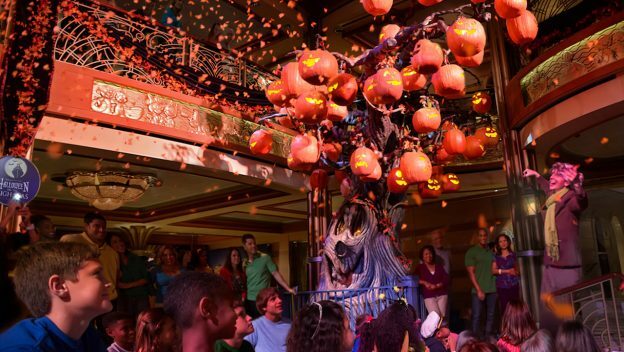 Mysterious Pumpkin Trees: Each ship’s Pumpkin Tree is unique, with Grim on the Disney Dream, Muckelbones on the Disney Fantasy, Bog on the Disney Wonder and Reap on the Disney Magic. Watch these trees magically transform from eerie and barren into the life of the party with sprouting Jack-O-Lanterns and flickering lights. A Nightmare Before Christmas—Sing and Scream, an interactive movie experience where guests are part of the action and immersed in the infamous Halloween Town, followed by a meet-and-greet with Jack Skellington and Sally. Haunted Stories of the Sea, where the bravest cruisers gather under the stars to hear some true—or not so true—tales of the sea told by a mysterious sea captain storyteller. Creepy Cabaret, Halloween-themed music performed live in the atrium by a band of ghostly musicians. Halloween Isn’t Just For Kids: For adults, the nighttime entertainment district becomes the ghoulish setting for a costume contest and a Villainous Takeover on the dance floor. 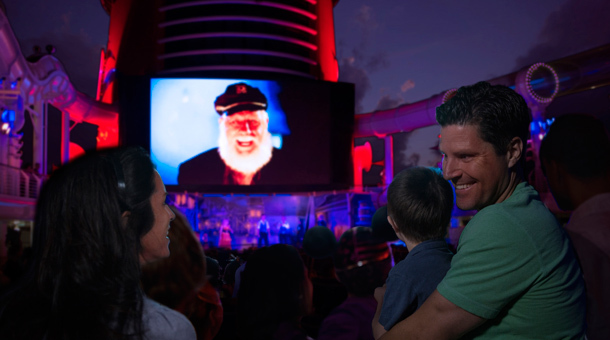 Spooky Movies: To get guests into the spirit of the season, Halloween-themed movies will be shown on Funnel Vision by the family pool and in staterooms. More spooky fun includes mask-making and a ghostly takeover of ship announcements! To celebrate Halloween, the Disney Dream sails three- and four-night Bahamian cruises departing Sept. 4 to Oct. 30; the Disney Fantasy sails seven-night Eastern and Western Caribbean cruises departing Sept. 2 to Oct. 28; the Disney Wonder sails two-, three-, four- and five-night Baja cruises, a seven-night Mexican Riviera cruise and a fourteen- night Panama Canal cruise departing Sept. 15 to Oct. 27; and the Disney Magic sails four-, five- and seven-night Canadian Coast cruises, and seven- and eight-night Bahamian cruises departing Sept. 27 to Oct. 28. It’s not too late to book your Halloween on the High Seas 2017 cruise! Siera is a travel agent with Destinations in Florida, an Authorized Disney Vacation Planner and member of the Cruise Lines International Association (CLIA). She would love to help you plan your next cruise at no cost to you. Contact Siera today at siera@destinationsinflorida.com or at 734-771-1290 for more information or your free, no obligation quote. This entry was posted in Cruises, Disney, Disney Cruise Line, Disney Cruise Line and tagged Disney Cruise, Disney Cruise Line, Halloween, Halloween on the High Seas on September 4, 2017 by siera. Bring a Costume: Even if you aren’t sailing on October 31, there will be opportunities to wear your Halloween costume during Halloween on the High Seas. The whole family is welcome (and encouraged) t0 show their costumes off during the cruise’s lively costume parties! Families can attend Mickey’s Mouse-querade Party with games, dancing, Disney friends and lots of candy. Plus, adults can enter the late-night Halloween Isn’t Just For Kids costume contest in the nighttime entertainment district. Plant a Pumpkin: Your family can play a role in bringing the Pumpkin Tree to life. The tree is tended to by a mysterious, storytelling caretaker, who you can join the first night of the cruise in planting enchanted pumpkin seeds beneath the shadow of the eerie branches. Then, the whole family will be amazed to watch as the tree magically transforms throughout the cruise from barren to the life of the party, full with unique and spooky Jack-O-Lanterns. Listen Up: Get into the spirit of the season with spooky sights and sounds. Enjoy the Creepy Cabaret—a band of ghostly musicians—as they perform Halloween-themed music live in the atrium. Then head out for Haunted Stories of the Sea, where the bravest cruisers gather under the stars to hear some true—or not so true—tales of the sea told by a mysterious sea captain storyteller. Say ‘Yes’ to Spooky Movies: All throughout the cruise you can catch Halloween-themed movies on Funnel Vision by the family pool and in your stateroom. And on one special night, you can enjoy A Nightmare Before Christmas—Sing and Scream, which is an interactive movie experience inspired by Tim Burton’s “The Nightmare Before Christmas” where you are part of the action. It’s followed by a meet-and-greet with Jack Skellington and Sally, a frightfully fun looking pair. Treat Yourself: This Halloween you can do more than just sneak a few pieces of your kids’ candy. 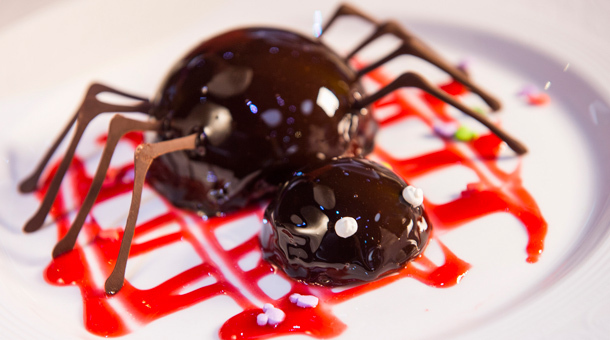 Disney’s chefs have conjured some very special treats for Halloween, including chocolate cake with pumpkin filling, spider cakes and “Spooky Juice.” These sweets are of course in addition to the assortment of desserts and special beverages you can indulge in throughout your cruise. 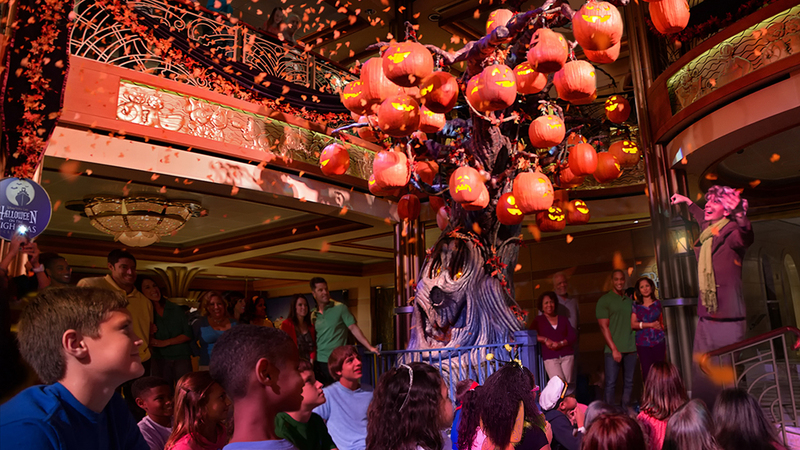 What are you most excited for during this year’s Halloween on the High Seas sailings? Siera is a travel agent with Destinations in Florida, an Authorized Disney Vacation Planner. She would love to help you plan your next vacation at no cost to you. Call her at 734-771-1290 or email her at siera@destinationsinflorida.com for your free, no obligation quote. This entry was posted in Cruises, Disney, Disney Cruise Line, Disney Cruise Line and tagged Disney Cruise, Disney Cruise Line, Halloween on the High Seas on September 5, 2016 by siera. Please note that these offers are subject to availability and do not include taxes, fees, or gratuities. These great rates must be booked by April 30, 2014. Are you planning to take advantage of these super low rates for September and October Disney Cruises? Siera is a Disney travel specialist. She would love to help you plan your next vacation at no cost to you. Request your free, no obligation quote on the right side of the page or email siera@destinationsinflorida.com for more information. This entry was posted in Cruises, Disney and tagged Disney Cruise Line, Halloween on the High Seas on April 4, 2014 by siera. Do you want to plan something special and fun for your family this Halloween? Your family is sure to love a Disney cruise this fall! 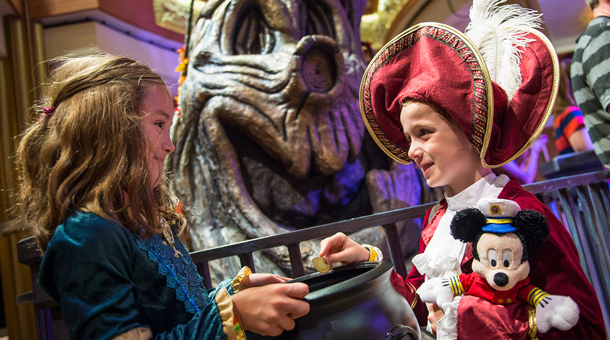 Disney Cruise Line will treat guests sailing this fall to a spook-tacular good time. 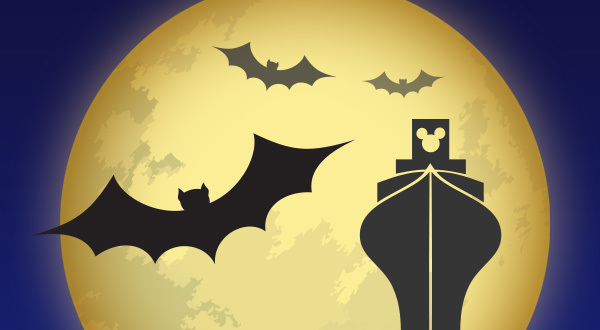 All four of the Disney ships will be transformed into a ghoulish wonderland complete with frightfully fun events and activities, elaborate decor, unique menu offerings in the restaurants, and even themed parties on deck. Mickey’s Mouse-querade Party, a celebration held in addition to Pirate Night featuring games, dancing, and plenty of candy! Some of your favorite Disney characters, donning special Halloween costumes just for the event, will join guests for this fun-filled costume party. 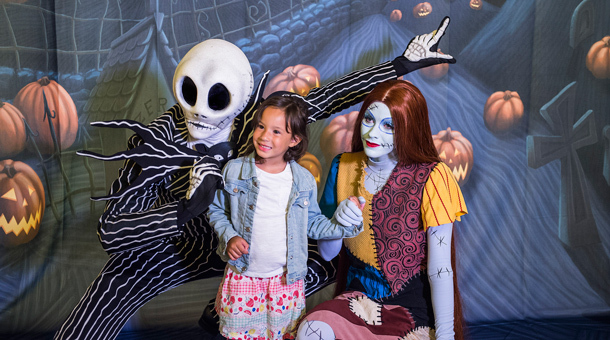 A Nightmare Before Christmas—Sing and Scream, an interactive movie experience where guests have the opportunity to be part of the action and then enjoy a meet-and-greet with Jack Skellington and Sally. Haunted Stories of the Sea, where only the bravest cruisers will gather under the stars to hear some true (or not so true) tales of the sea told by a mysterious sea captain storyteller. Creepy Cabaret, a party in the atrium with Halloween-themed music performed live by a band of ghostly musicians. Halloween Isn’t Just For Kids: For adults, the nighttime entertainment district will become the ghoulish setting for a costume contest as well as a Villainous Takeover on the dance floor. Spooky Movies: To help get guests into the spirit of the season, Halloween-themed movies will be shown in Buena Vista Theatre, on Funnel Vision by the family pool, and in guest staterooms. More spooky fun includes mask-making and a ghostly takeover of the ship announcements! Siera is a Disney travel specialist. She would love to help you plan your Disney Cruise Line vacation at no cost to you. Request your free, no obligation quote on the right side of the page or email siera@destinationsinflorida.com for more information. This entry was posted in Cruises, Disney and tagged Disney Cruise Line, Halloween, Halloween on the High Seas on February 21, 2014 by siera. The holiday season is now in full swing, but it’s not too early to start thinking about next year’s plans to make it better than ever before. Would you like to try something new or special for next year? 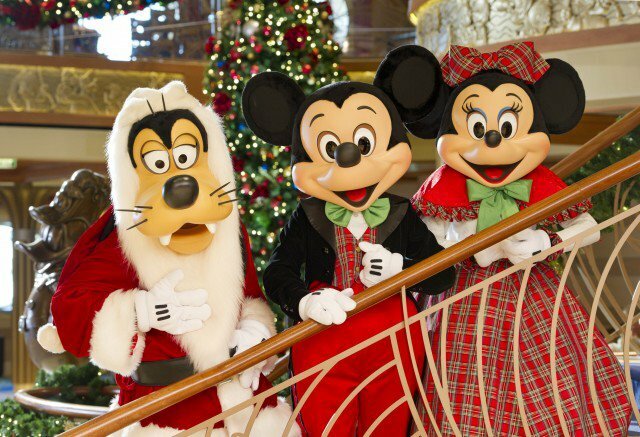 Why not enjoy one of the 2014 Disney Cruise Line Holiday sailings? There are special Halloween and Christmas cruises with something for every member of the family to enjoy! With special events and activities planned, you are sure to make this a vacation to remember! Since these themed voyages were so popular in 2013 that, in 2014, special events will be held on all four Disney Cruise Line ships! Don’t forget, there’s just a few days left to enjoy 50% reduced deposits on Disney Cruise Line vacations when booked by December 15, 2013. This makes it more affordable than ever to give your family the gift of a Disney Cruise Line vacation. Siera is a Disney travel specialist and would love to help you plan your Disney Cruise Line vacation at no cost to you. Request your free, no obligation quote on the right side of the page or email siera@destinationstoexplore.com. 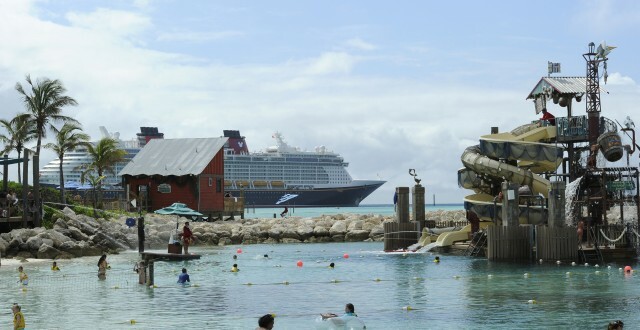 This entry was posted in Cruises, Disney and tagged 2014, Disney Cruise Line, Halloween on the High Seas, Very Merrytime cruises on December 12, 2013 by siera. 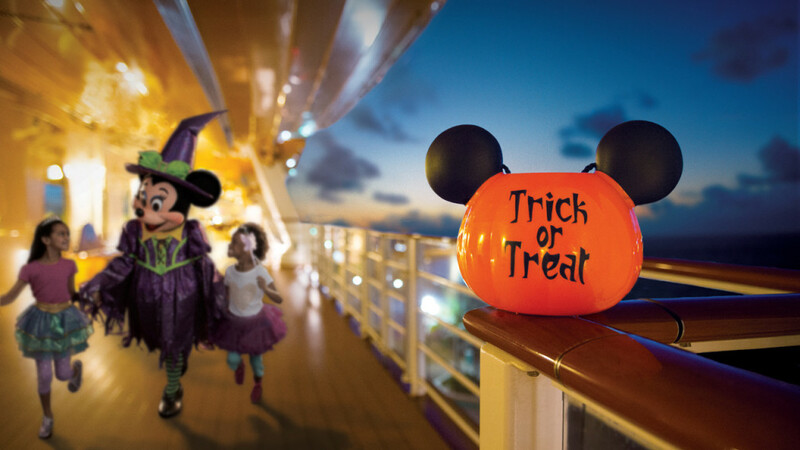 It’s not too late to plan to spend Halloween aboard Disney Cruise Line and participate in the festivities! Siera is a Disney travel specialist and would love to help you plan your upcoming Disney Cruise! Request a free quote on the right side of the page or email spreadingmagic@gmail.com! This entry was posted in Disney, Uncategorized and tagged Disney Cruise Line, Halloween, Halloween on the High Seas, trick or treating on August 11, 2013 by siera.